Me: Day’s going okay so far. K and I are both still alive. Could you make arrangements to swap stuff with the Barretts for Saturday? John: Right. Will do that! No problem. I seem to be making random animal noises today. Odd. Me: Uh, okay. For now, it falls into the category of “not my problem”, but if you’ve not stopped by when you get home, I’ll fix the situation. In other news, I washed your socks and underwear. Hanging out laundry is pretty dull. 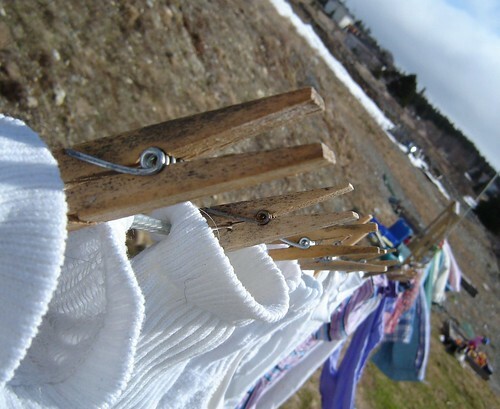 Can we start writing large letters on your underwear bottoms so that I can spell things out on the clothesline? John: Depends entirely on what you want to say……. Me: Oh, I just want to use your drawers to spell out big words and impress the neighbours. And send messages to the aliens about where to land. No. Wait. Sorry. Was just reading about Tom Cruise and got momentarily confused. Scratch the aliens. John: Why? Are they itchy? And I’ve been expecting them any day now. Don’t scare them away. John: What would you spell out with the laundry, anyhow? “Well-hung”? hmmmmmmmmmmmmmmm. I wonder just how many comments you will get with THIS one!!!!! Remember what I said about living in the same neightborhood? I’m reconsidering. The scary part of this is that John liked the idea so much that he was about ready to go and put masking tape or coloured tape letters on some of his drawers so as to be able to take a photo and post it on Flickr. Wonder what the aliens would think of that one? DO IT!!! :} Live dangerously!!! !